This peak is #1 on the Height List for Washington . This peak is #1 in Prominence List for Washington .Mount Rainier, in the state of Washington, is the tallest of the chain of volcanoes that starts at Mount Garibaldi and extends south to Lassen Peak in northern California. However, Mount Adams spreads out over a bigger area. Because it is only 3 hours drive from Vancouver it is often visited by Canadian climbers, as well as climbers from Seattle. These volcanoes are often referred to as being part of the "Cascades" however they obviously have quite a different origin than the Cascades of northern Washington. Having said that, Mount Rainier is the highest peak in the "Cascades", and has the largest glaciers in the lower 48 states until you get into Alaska. The summit of Mount Rainier has two summit craters. The highpoint of the mountain is called Columbia Crest. The craters are filled with ice, and have a network of ice caverns, carved by heat from the mountain, similar to Mount Baker. Mount Rainier is not part of a mountain range per-se, it stands alone surrounded by coniferous forests. Above treeline at about 1600 m there are beautiful alpine meadows which in certain seasons are covered with wild flowers. Mount Rainier is almost always climbed as a glacier climb because the volcanic rock is typically rotten. 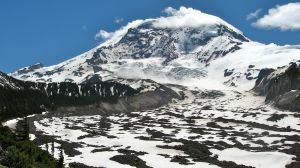 The upper part of the climb usually requires ice ax and crampons, although it is quite straightforward to ski up to Camp Muir at about 3000 m. There is a large shelter of some sort at Camp Muir, although most parties tent. Name Notes: The Indian name for Mount Rainier is Tahoma, whence comes the name of the nearby city. Frontier-era legends of giants sleeping in giant, flame-hewn chambers with all kinds of strange electrical devices deep inside the mountain, are thought to be derivations of older Indian legends concerning similarly sleeping giants and lakes of fire inside the mountain (albeit without the Wellsian machineries described in the non-native version).